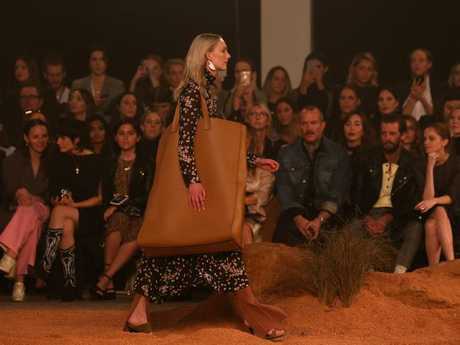 A NEW fashion trend has hit the runway so impractical it left Elsa Pataky terrified she'd topple over if she ever adopted it. 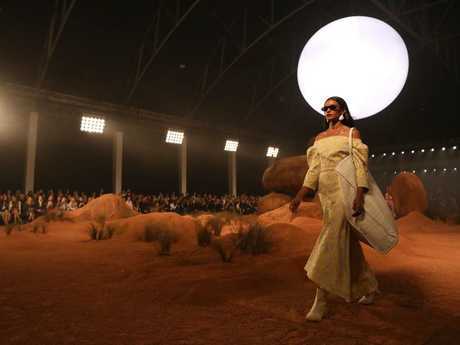 It wasn't the glowing orb, blob sculpture or dirt floor that signified we were in a place far, far away at Sunday's Camilla and Marc runway show which officially opened Mercedes Benz Fashion Week. It was the sight of tiny women marching around with gigantic bags. Not just oversized handbags or a really roomy tote. These were massive. Bags so huge they enable you to leave the house armed with everything you own while still allowing enough room to ransack an entire Aldi. Or, if you felt like putting a fun spin on that dogs-in-handbags trend - you could zip around your local Westfield with your boyfriend peeping out the top of one. He'd be able to rummage around and hand you everything you need in a flash: Visa. Phone. The keys to your spaceship. One by one on Sunday, the models hit the 120 metre long runway and were forced to trudge through 60 tonnes of rubble and dirt that was shipped in specifically for the event. It was touted as a "zen garden". Visually stunning, yes. But Zen tends to evaporate when you're made to lug a handbag the size of a Hyundai through a dusty outback-space-age landscape. Elsa Pataky - the model, actress and wife of Chris Hemsworth - loves an oversized bag. I'm always scrolling through photos of her running around shoeless in Byron Bay with huge leather bags slung over her shoulder - leather fringing and straps flailing in the breeze. She put her cool and bohemian life on hold for the weekend and left the kids with Chris to make a star appearance at Sunday's opening show. "You're wearing shoes!" I blurted after mildly accosting her to gauge whether these gigantic bags would be too big even for her. She diplomatically explained she loves them but also enjoys not being inflicted with permanent spine damage.
" ... They're very useful for the beach to put everything in there - but look at me! I'm so tiny that in a way I would fall over because it's so big," she laughed. I then asked if she was sick of those Damons always following her around and she awkwardly introduced me to Matt's wife Luciana who was standing directly next to us. A publicist promptly whisked them away. And I crawled into one of those gigantic bags to die. I swear she’s not normally wearing shoes. Perfect for the corporate, space-age woman on the go.